All of these answers are impossibly reductive. The city of Detroit has no one problem; it has a constellation of them. Here, in no particular order, are some of the most important factors. 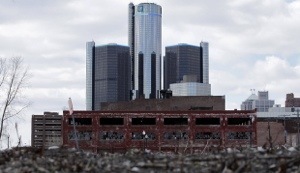 Any political system that has a convenient other to complain about will use that other to excuse the failures of its politicians, and Detroit has been no exception. The city has been plagued by flagrant corruption and plain old bad management. It’s also confronted the same painful math as Rust Belt cities like Buffalo and Rochester: The poor folks in the city want high levels of government services to alleviate their poverty. But if you raise taxes to pay for the services the voters want, the taxpayers will leave. Megan Mcardle has a way of getting to the knot at the center, this has all been said before but here it is laid out, and as in so many human stories the tragedy was rooted in the heady heydays. This entry was posted in culture, politics, Society / History and tagged Detroit, overview by Sci Fi Engineer. Bookmark the permalink.